Nancy Pauline Simpson is the author of B.O.Q. and Tunnel Vision (an updated edition of which is now available electronically from all e-book retailers). Here she talks about the inspiration for her story “Rough-Hewn Retribution” (from the March/April issue), and the development of the story’s characters, Miss Halzetine Polk and Deputy Sheriff Stickley. All families come equipped with stories and a lot of those stories include a mystery. Whether those stories get passed on depends more on the number of raconteurs a family produces than the number of babies. In the case of my family, a particular spot in central Alabama and the time popularly known as “The Downton Abbey” era produced a glut of raconteurs. In England, that era represented the lull before the storm of World War I. In the Southern United States, it was the lull between storms, one of which was still rumbling in a lot of people’s living memory. Under seemingly still waters ran a class system based on race. The peculiar interdependency of Blacks and Whites generated family stories that can lead a writer in fictional directions that just wouldn’t be credible in another setting. One of my family’s stories was the jumping-off point for “Rough-Hewn Retribution.” (Other stories served the same purpose for two earlier AHMM stories with the same setting.) I’d heard the basics—a hotel porter reporting his suspicions about a traveling salesman to his employer, leading to extreme consequences—multiple times. Three generations from the original version, I have no way of knowing what, if any, of it was true. But, since anybody who could verify any part of the story is long dead by now, I felt free to let my imagination fill in the plot details. The characters of Deputy Sheriff Stickley and county nurse Hazeltine Polk evolved from family members, but their occupations did not. I chose those occupations in order to bring Stickley and Polk into contact with people and situations my real-life kin—especially the respectable female ones—might have been shielded from. Stickley may be uncomfortable allowing Miss Polk to examine a male corpse’s genitalia, but—because she has been trained as a nurse—he defers to her superior knowledge of human anatomy and stifles his squeamishness. He admires the county nurse’s level-headedness almost as much as he admires her auburn hair. And he has his own professional ambitions. Those ambitions naturally mesh with his personal goal of winning Miss Polk’s affection. He hopes she’ll appreciate that the doggedness, integrity and powers-of-observation that make for a good investigator also make for a good husband. I wanted to make their compatibility—and chemistry—clear. I also wanted to show contrasts. Both are intelligent, but Stickley has had little formal education. His appreciation for art and literature is instinctive, not taught. Stickley’s fractured grammar is distinct from Polk’s more refined English. Miss Polk would never correct his grammar, of course, and not just because it would be ill-bred to do so. Women are assumed to be more particular about such niceties as grammar. In an attractive, sober man, character and good sense can compensate for a few rough edges. In any case, cleverness disguised as folksy simplicity has a long history of its own. When Stickley refers to “the Oracle of Delphinium,” is it a verbal blunder or is he just pulling his own leg? The reader understands from his context that he knows perfectly well what an oracle is. For me, the most interesting element of a mystery plot is the motive. When the crime involves violence, that motive should be a doozy. The “why?” of crime is more compelling to me than the “how?” In the case of the criminal psychopath, there is no rational “why.” I am relieved when forensic science stops a serial killer in his bloody tracks, of course. But the criminal who responds to emotions everyone has experienced is more intriguing. When Stickley asks the retiring sheriff how he could have committed such a grisly act years earlier, the reader knows that the answer comes from a sane man. Hamlet, but there are plenty of motives to pick from. And, maybe, a few of them will rouse a little empathy. Every sub-genre has its peculiar satisfactions—a reality recently borne in on Elaine Viets, who launched a new and darker series in our November issue. Here she reflects on some of the opportunities it offered. 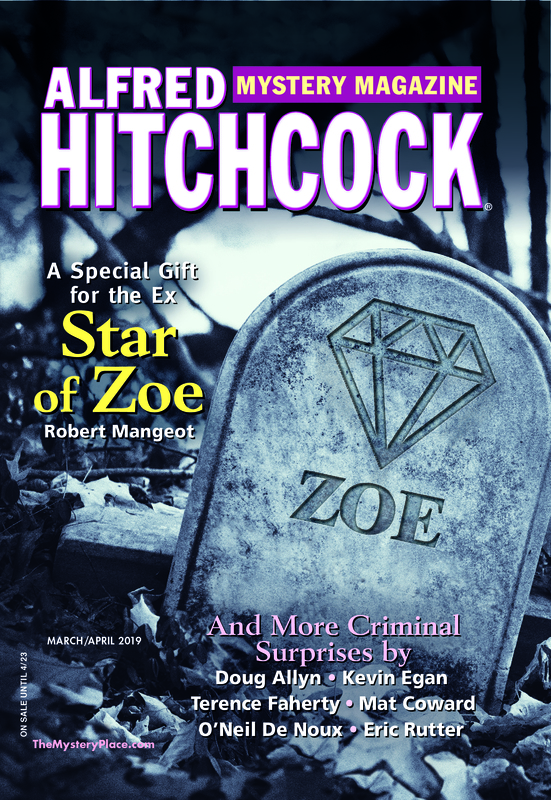 Alfred Hitchcock’s Mystery Magazine heralded my return to the dark side in November with a hardboiled short story. “Gotta Go” introduced Angela Richman, a death investigator in mythical Chouteau Country, Missouri, stronghold of the over-privileged and the people who serve them. Death investigators work for the medical examiner’s office. At a suspicious death, DIs are in charge of the body. The police handle the rest of the crime scene. AHMM brought good luck. As “Gotta Go” was published, I signed a two-book deal with Thomas & Mercer for the Angela Richman mysteries. Brain Storm, the first mystery in the new death investigator series, will debut at Thriller Fest this July. After a decade and a half of writing traditional Dead-End Job mysteries and cozy Josie Marcus, Mystery Shopper novels, I was back writing bloody, forensic-heavy mysteries. The death investigator mysteries aren’t too gory—not like Patricia Cornwell “I boiled my dead boyfriend’s head.” This death investigator series is more like the TV show Forensic Files, without the commercials. I was back home again. My first series, the Francesca Vierling newspaper mysteries, were hardboiled. When Random House bought Dell and wiped out that division, I switched to the traditional Dead-End Job mysteries, featuring Helen Hawthorne. The Art of Murder, the fifteenth novel in the series, will be published in May 2016. I also wrote ten cozy Josie Marcus, Mystery Shopper mysteries. I love both series, but wanted to write dark mysteries again. But I didn’t want to do another police procedural, or a private eye with a dead wife or a drinking problem. Other writers had done those and done them well. But death investigators were a profession many readers didn’t know about. Janet Rudolph, founder of Mystery Readers International agreed. She believes Angela Richman is the only death investigator series. Last January, I passed the MedicoLegal Death Investigators Training Course for forensic professionals at St. Louis University. I wanted the training—and the contacts—to make the new series accurate. I’ll still keep the Dead-End Job mysteries. In fact, I’ll need them. Their light-hearted look at Florida will keep everything from becoming too grim. The sun-splashed craziness of South Florida should counteract the intensity of the death investigator series. Now I that I’m writing dark again, my writing has changed. My characters can cuss. Angela Richman’s best friend and colleague is Katie, Chouteau County assistant medical examiner Dr. Katherine Kelly Stern. Pathologists tend to be eccentric, and Katie is based on a real pathologist who’d perfected the art of swearing. Her profanity was a mood indicator. I could tell how angry she was by whether she used “fricking,” “freaking,” or the ultimate F-bomb and how often she employed these and other cuss words. Oddly enough, when she swore, the words didn’t sound offensive. Katie cusses with style and grace in Brain Storm. Body counts. In cozy and traditional mysteries, the murders take place off-stage. Readers aren’t forced to take a blood bath when they read the death investigator mysteries, but they will see crime scenes and forensic procedures. They’ll get a firsthand look at the sights, sounds, even the smells of death. Real weapons. In cozy mysteries, when Josie Marcus battles killers, she resorts to “domestic violence,” using kitchen tools, gardening equipment, and whatever she can grab for weapons. Helen Hawthorne in the Dead-End Job mysteries is a little bolder. She’s armed with pepper spray to take down killers, though in Checked Out she did get sprayed with her own weapon. In Brain Storm, when Angela confronted the killer, she was in an office, surrounded by the standard supplies: waste baskets, chairs, coffee mugs, letter openers. I was prepared to have Angela grab one, when it dawned on me: Wait! This isn’t a cozy. So Angela shot the killer in the head. It felt so good.